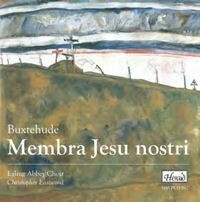 The cantata cycle Membra Jesu nostri is very much part of the standard repertoire for Passiontide these days. There is certainly no lack of recordings. Unfortunately we know next to nothing about when and where it originally may have been performed. As a result it is impossible to say how many singers were involved in performances in the composer's time. In some recordings these cantatas are performed with a choir, in others with one voice per part, sometimes with additional ripienists. This recording falls into the first category. Membra Jesu nostri is a most remarkable work considering that it comes from the pen of a Lutheran composer who dedicated it to his "honoured friend" Gustav Düben (c.1629-1690), who was Kapellmeister at the Swedish court - also firmly Lutheran. The text is a combination of verses from the Bible and extracts from Rhythmica Oratio, a collection of hymns which address the parts of the body of Christ hanging on the cross. In Buxtehude's time this work was attributed to Bernard of Clairvaux, one of the most prominent medieval mystics. In the liner-notes Lewis Brito-Babapulle refers to the rise of Pietism within German Lutheranism in the second half of the 17th century. That is certainly relevant, but even before that there was a vivid interest in medieval mysticism. In particular the Vier Bücher vom Wahren Christentum (1606-09) (Four Books about True Christianity) by the Lutheran theologian Johann Arndt (1555-1621) played a crucial role in the spreading of Bernard's mysticism. All cantatas have the same structure. They start with an instrumental sinfonia, which is followed by the dictum - a quotation from the Bible - set in the form of a concerto for 3 to 5 voices, and three arias for one to three solo voices, supported by basso continuo, which are divided by instrumental ritornellos. At the end the dictum is repeated, with the exception of the seventh cantata which ends with "Amen". This suggests that these cantatas were indeed intended as a cycle. The rather introverted and pietistic character of this cycle seems to suggest a performance with a small number of singers. Brito-Babapulle tries to prove that a performance with a choir of boys and men is plausible. He does so by stating that "it is difficult to conceive that Buxtehude did not have such a major work performed in his own church during his lifetime". However, this is surely an example of wishful thinking without any firm historical foundation. There is every reason to consider Membra Jesu nostri a "major work", but that is a present-day assessment, not necessarily Buxtehude's own. It is difficult to see how this work could have been performed as part of the liturgy in the Marienkirche in Lübeck, where Buxtehude was organist. Another option would be the Abendmusiken but in that context Buxtehude mostly performed large-scale dramatic works. Moreover, these Abendmusiken took place in November and December, during the last two sundays after Trinity and the second, third and fourth of Advent. That is not the time to perform a work like this. The Ealing Abbey Choir sings here with 19 trebles, two male altos, three tenors and three basses. Five of the trebles also sing the soprano solos; booklet does not indicate who sings what. The three adult soloists are also members of the choir. There can be little doubt that this is a fine choir, and it is not surprising that the tutti episodes come off best. However, the balance between trebles and adults is less than ideal, as is so often the case in choirs of boys and men, in which the number of trebles is always much larger than the number of adults together. The solo parts are not that convincing. The treble soloists all have nice voices and sing pretty well, but their voices are mostly not strong enough and there is little expression in the soprano arias. Sometimes the intonation is also a little suspect. A general feature of the solos is that there is too much legato singing, whereas German music requires a sharper articulation. Whether one appreciates a voice is a matter of taste. I don't like alto and bass very much. Geoffrey Williams lacks firmness and his performances are sometimes a little shaky. David Milner-Pearce has a strong voice, but sounds rather harsh. I miss the sensitivity which is required in a work like this. Tom Cragg has a clear voice and sings beautifully. The three adult soloists don't blend very well in the arias for the three lower voices. Here the alto tends to dominate. The Ealing Abbey Consort play period instruments and do so quite well. I especially liked the sonata of the fourth cantata. On the other hand the tremolos in the sonata from the second cantata should have been more pronounced. To sum up, this is a sympathetic and respectable recording which offers some good things, especially the tutti parts. However, considering the large number of fine recordings in the catalogue I can't see how this disc can present serious competition on the international market.